Budget deficits are soaring and printing presses are running at full steam everywhere you look including Germany and the Eurozone countries. Please consider Recession Upends German Zeal for Fiscal Prudence. It has come to this: Germany will almost certainly have a bigger budget deficit next year than Italy will. Traditionally, Germany is the Continent’s keeper of fiscal rectitude, perpetually fretting that the Italians and other free-spending Southern Europeans are about to undermine the euro and rekindle inflation by not reducing their red ink. But in 2010, the German deficit is expected to total 6.5 percent of its gross domestic product, while the Italian gap is forecast at 6.2 percent of G.D.P., according to Deutsche Bank. The German shift underscores just how profoundly the economic and political situation has changed in Berlin, as well as how desperate Chancellor Angela Merkel is to restore growth in Europe’s largest economy as she begins her second term. Given the longstanding aversion to borrowing and spending that has shaped German fiscal policy since the great hyperinflation of the Weimar era during the 1920s, Mrs. Merkel and her new finance minister, Wolfgang Schäuble, have set off a fierce debate by proposing to cut taxes by 24 billion euro, or $35.9 billion, in 2010 and 2011, rather than immediately attack the country’s projected budget gap. The terms of the treaty that created the euro currency are supposed to limit each country’s deficit to no more than 3 percent of its G.D.P. None of the 16 countries that use the euro are expected to meet that goal soon, however, with the typical budget deficit projected to reach a record 6.9 percent of G.D.P. next year, according to the European Commission. But for all the efforts to keep everybody on board, Mrs. Merkel could be on a collision course with much of the business community, as well as Axel A. Weber, the head of the Deutsche Bundesbank, who sits on the governing council of the European Central Bank in Frankfurt. In a speech last month, Mr. Weber set 2011 as a crucial deadline for Europe to begin digging out of the stimulus measures and deficit spending now under way. “Given the enormous rise in public deficits and the strain this will put on future budgets, the fiscal exit strategy will have to kick in as soon as the recovery has firmed up, which means no later than 2011,” he said. Among ordinary Germans, the desire for fiscal discipline still runs deep as well, setting the stage for further tensions down the road if the economy lags. A poll published last month by Forsa, the independent polling institute, showed that only 22 percent wanted tax cuts if they would lead to a wider budget deficit and more public borrowing. Nearly 70 percent were against the idea. Moreover, a new law limits federal deficits to 0.35 percent of gross domestic product from 2016 onward and no longer allows the federal states to run deficits at all from 2020 onward. I am all in favor of cutting taxes but the problem is government spending. Not a single country is the Eurozone is close to the 3% budget deficit pledge required to adopt the Euro. Does anyone think the Eurozone countries will adopt balanced budgets by 2020? I don't but we can hope. Right now, Europe, including Germany looks like a basket case except compared to the US and Japan. 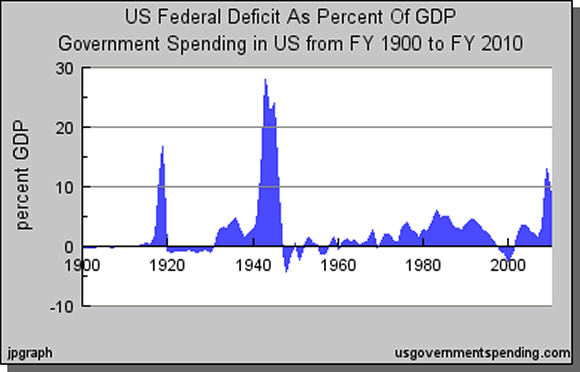 Inquiring minds are looking at a chart of US Federal Deficit As Percent Of GDP. The 2009 projection is a whopping 12.93% and 2010 sits at 8.54% compared to a 6.9% Eurozone projection for 2010. The Wall Street Journal is asking Can DPJ Rein In Japan's Deficits? The DPJ campaigned on a platform of people-first social services, promising to boost domestic demand by easing the financial burden on households with a child-care allowance, health-care changes and the elimination of highway tolls. The proposals are expected to cost some seven trillion yen, or around $75 billion, in the fiscal year starting April 2010, rising to 16.8 trillion yen in the fiscal year ending March 2014. As it stands, next year's initial budget is on track to require 21.9 trillion yen to finance Japan's public debt, or about 170% of gross domestic product, the highest among industrialized nations, the Finance Ministry said Monday. According to Stratfor's analysis of Japans's Budget "Further deficit spending will push Japan's budget deficit above the 8.5 percent of GDP recorded in 2008 and the government debt of 170 percent of GDP even further into uncharted territory." Stratfor's total was before the landslide victory for the DPJ in Japan. The victors have an emotive name for it: seiken kotai, or regime change. It came in brutal fashion on Sunday August 30th when Japan, Asia’s richest democracy, dumped the party that has ruled it for almost all of the last 53 years and gave a huge win to one that until recently had little idea of how it would govern. In a historic result, unofficial results showed that the Democratic Party of Japan (DPJ), a leftist grouping of ruling-party renegades, social democrats and socialists, was heading for a landslide. It is led by Yukio Hatoyama, a mild-mannered career politician likely to be the next prime minister. He promises a government less beholden to the powerful civil service, wants to temper the free market and is keen to dole out cash to the disadvantaged in the economically stagnant and ageing country. Good luck with that ideology. Japan looks like a basket case compared to anything else, even the US. Deficits will crush Japan far sooner than the US in my opinion. Please consider Rising Debt a Threat to Japanese Economy. How much debt can an industrialized country carry before the nation’s economy and its currency bow, then break? The question looms large in the United States, as a surging budget deficit pushes government debt to nearly 98 percent of the gross domestic product. But it looms even larger in Japan. Here, years of stimulus spending on expensive dams and roads have inflated the country’s gross public debt to twice the size of its $5 trillion economy — by far the highest debt-to-G.D.P. ratio in recent memory. Just paying the interest on its debt consumed a fifth of Japan’s budget for 2008, compared with debt payments that compose about a tenth of the United States budget. Yet, the finance minister, Hirohisa Fujii, suggested Tuesday that the government would sell 50 trillion yen, about $550 billion, in new bonds — or more. How Japan got into such a deep hole, and kept digging, is a tale of reckless spending. The Democratic Party, which swept to victory in August, promises to rein in public works spending. But the party’s generous welfare agenda — like cash support to families with children and free high schools — could ultimately enlarge budget deficits. “It’s dangerous for the Democrats to push on with all of their policies when tax revenues are so low,” said Chotaro Morita, head of fixed-income strategy at Barclays Capital Japan. 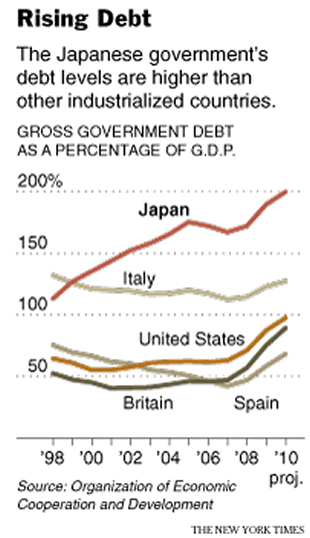 “From a global perspective, Japan’s debt ratio is way off the charts,” he said. 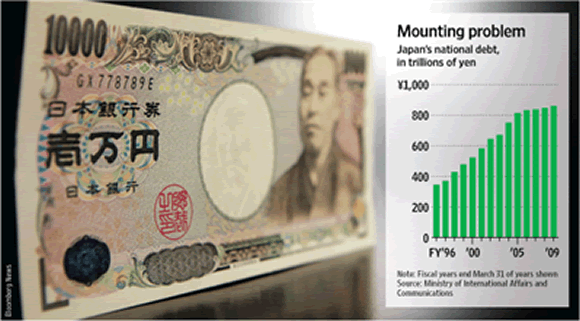 In the long run, even Japan’s sizable assets could fall and eventually turn negative. Japan’s rapidly aging population means retirees are starting to dip into their nest eggs — just as government spending increases to cover their rising medical bills and pension payments. “The yen is set to enter a long decline” in both stature and value as investors lose confidence in Japan, said Hideo Kumano, chief economist at the Dai-Ichi Life Research Institute in Tokyo. Inquiring minds are also interested in a UK Government Debt & Deficit Snapshot. 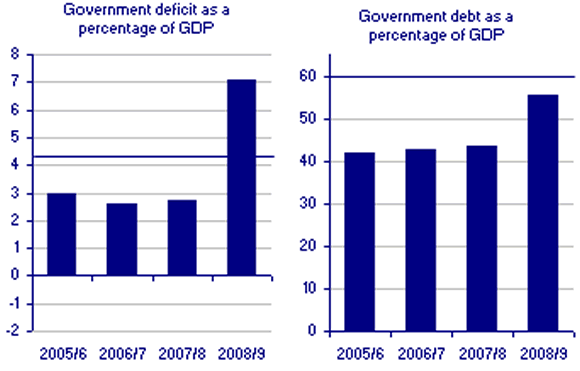 In the financial year 2008/09 the UK recorded a general government deficit of £101.3 billion, which was equivalent to 7.1 per cent of gross domestic product (GDP). Bear in mind those numbers are for 2008/2009. Think they get any better? I don't. Now let's consider something that has no budget deficit. See any fiat currencies above that you like? Assuming you don't, I don't either. Moreover, I think the Yen is the worst of the lot on a relative basis. I also think the Yen is likely to have a serious currency crisis before the US. In the meantime, if you are looking for an explanation for gold's strength that goes beyond the tired one-sided dollar bashing analysis routinely offered most everywhere you look, now you have it.